Lactose monohydrate NF, microcrystalline cellulose NF, croscarmellose sodium NF, hydroxypropyl cellulose USP, magnesium stearate NF, hypromellose USP, titanium dioxide USP, talc USP, polyethylene glycol NF, ferric oxide pigment, yellow NF, and ferric oxide pigment, red NF. Lactose monohydrate NF, microcrystalline cellulose NF, croscarmellose sodium NF, hydroxypropyl cellulose NF, magnesium stearate NF, hypromellose USP, titanium dioxide USP, talc USP, polyethylene glycol NF and ferric oxide pigment, yellow NF, and ferric oxide pigment, red NF. Went from moderate hormonal acne to very light acne in a month. 7 'off' pills.. during which my skin will occasionally still break out, albeit lightly. My year-long battle with hormonal acne started when I stopped taking Yaz to switch to another pill. During this time I had severe breakouts like I've never had in my life. 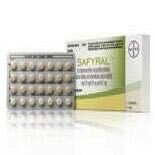 After trying several other birth controls, my OBGYN had me try Safyral because it's almost the same thing as Yaz or Yasmin, only with a slightly higher dose of estrogen, plus a folate B vitamin to reduce the chance of birth defects, like Beyaz. Let me tell you, I love it! Now, Safyral is Ethinyl Estradiol 0.03mg (estrogen) and Drospirenone 3mg (a close cousin of Spironolactone, an anti-androgen) and has worked wonders for me. Everyone is different; I'm not saying it's going to be a miracle for every woman, but if you're thinking about trying this for hormonal acne I'd give it a shot!